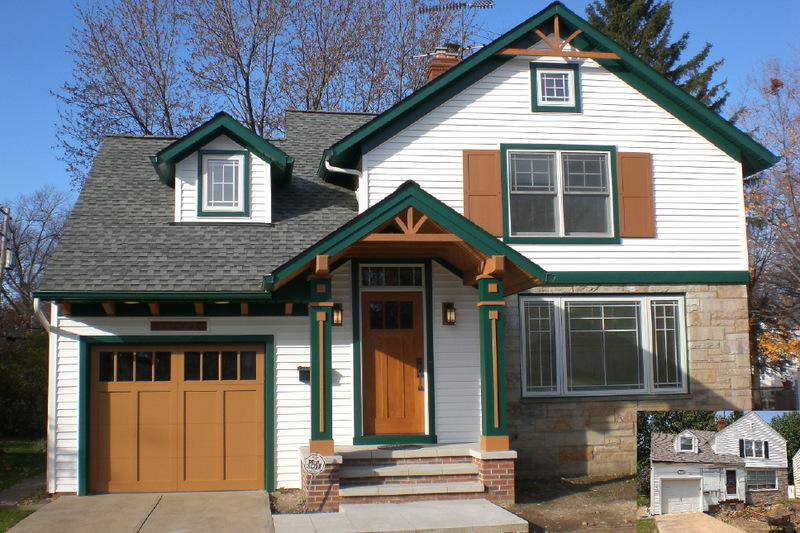 This plain minimalist sixty year old Bungalow suffered severe exterior winter damage to the existing front porch, porch overhang, eaves, and gutters to the point where complete replacement was necessary. Upon discussing the replacement work, the owner and builder decided that the repairs did not have to match the original plain architecture but could possibly be designed according to the owner’s penchant for the “Arts and Crafts” building style along with her needs. The Homeowner had completed two previous remodeling projects which were presented with exclusive awards for best Kitchen and Interior “Arts and Crafts” theme. The home is located in a modest neighborhood where budget becomes a very important factor for cost vs value. Also, any new exterior design would need to be created according to the city’s building setbacks and codes which while exemplifying the preferred “Arts and Crafts” theme, meet the budget, and not sacrifice “Green Building” technology goals. worker’s craftsmanship should take precedence over prefab construction. The existing deficient front porch was completely demolished and rebuilt with a larger open porch roof, landing, and steps. The porch can now efficiently protect the owner when arriving home and along with welcoming of her guests. Like most 50’s homes, this residence previously lacked overhangs and protection for friends and homeowner alike during egress and ingress. The new porch gable and the extension of the overhangs ventilate the attic more efficiently and provide protection from the environment while keeping the “Green Building” methods always in mind while the gable timber structures add to the style. The new foyer was created by elimination of the existing closet walls and replacement with fine custom cabinetry coordinated with previous interior renovations. The flat foyer ceiling was restructured to allow for a cathedral ceiling creating volume. This was possible through the installation of a laminated wood structural beam system serving as the new bearing for removed walls. The existing windows were replaced with the new energy efficient Architectural Prairie style windows. The front door with its fiberglass skin allows the decorator to finish and match the cherry wood grain of the new closet cabinetry. Even the new overhead garage door style was perfectly matched with the detailed exterior architecture and the new green-shaded asphalt shingled roof to create the “Green” Arts and Crafts philosophy.